I have been at Creighton University since the early ‘70’s teaching in the theology department. I teach in the Christian Spirituality Master’s Degree Program, a summertime program which focuses on preparing persons to be active in the apostolate of spiritual direction and retreat work. Since 2001 I am an Assistant Vice President for University Relations. This puts me in contact with alumni from around the country as well as other duties in public relations and in development at Creighton. I serve as the chaplain to the School of Dentistry, as the moderator of the Alumni chapter of Alpha Sigma Nu, the Jesuit Honorary Society, and as the chaplain for the men’s and women’s intercollegiate basketball teams. I am originally from Milwaukee, the seventh son born of Martin William and Magdalene (Kersten) Shanahan. My brothers and their families live primarily in the Milwaukee and Chicago areas. 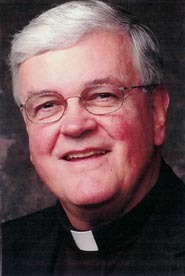 Some of you may be familiar with my Jesuit brother, Robert, who served at Creighton University for almost 40 years until his death in 1998. Some also may be familiar with my niece, Maureen Shanahan Crouchley (husband, Dan) and nephew, Terry Shanahan (wife, Clare Dodson). Terry and Maureen, both graduates of Creighton University in the mid ‘70’s, live in Omaha with their families. Creighton University and Omaha are now home for me. Doing these reflections over these past years has provided me with a wonderful opportunity to reflect on my faith in a more public way. The reflections are a challenge to make faith more experiential and vibrant. The task is to personalize faith and to see its relevance in my day-to-day life; not to keep it as a private, vague thing that is merely peripheral to my life. My hope is that these reflections will be an invitation to others to grow in faith, in hope and in love, the God-given virtues that we all are blessed with at our baptism.